In design, sometimes things go easily, and sometimes they don't. Today's article is about an example of the latter, a mechanic that was on the verge of being removed from Dominaria for almost all of set design and the lengthy steps I took to save it. It's finally time for me to tell the historic story of the historic mechanic. Also, I have a preview card to show off that'll trigger your historic payoffs, a legendary character that I co-created (along with Michael Ryan). Before I discuss the lengths I went through to save it, I think it's important first to explain why I cared so much. Things get changed all the time in set design; mechanics come and mechanics go. I seldom fight the changes that happen downstream from vision design. Why was this time so different? To explain, I will turn to my favorite metaphor for vision design. Let's say we're building a house. Vision design is the architect. We're getting a sense of what it is we're building. We're creating a blueprint to communicate our vision and allow set design to physically construct the house. Set design can make all sorts of changes to the house as they're building it. Maybe they want to change carpet to hardwood floors, or they want to add some windows, or they want to put some additional stone on the fireplace. As the architect, I don't jump in. That's the right of the house builder to adapt as they're building. Now let's say they decide to knock down a wall because they want to make one room bigger. In that case, as the architect, I'll jump in if the wall they want to tear down is a load-bearing wall, if it exists to hold up the second floor. That change is going to cause a structural problem for the house, so as the architect I have an obligation to intervene. That's basically what happened here. Last week, I talked about us trying to capture the concept of history in a mechanic. I mentioned that Aaron suggested caring about artifacts and legendary things and that I latched onto the idea very quickly. What I didn't talk about was why. Why was the combination of artifacts and legendary things better than just focusing on legendary things? To understand this, we have to go back to Champions of Kamigawa block, the one time we tried to make legendary things matter. I've talked about how that block made a lot of design mistakes, and one was the "legendary things matter" theme. Let me get into the nuts and bolts of the problem. "As-fan" is an R&D term, short for "as-fanned," that refers to how much of a particular characteristic shows up in an average booster. An as-fan of 1 would mean that we expect, on average, one card with that quality to show up in every booster. So 1.5 would mean that on average one and a half cards of that quality show up. You can get fractions because we're averaging across all the boosters. Five boosters having one and five boosters having two is an average of 1.5. As-fan is a problem because legendary cards tend to skew toward higher rarities. In most sets, they only appear in rare and mythic rare. Kamigawa block had all the rare creatures (mythic rare wasn't a thing yet) be legendary and it still didn't occur often enough for most players to realize it was a thing. We even added some uncommon legendary creatures (something we do infrequently), and still the as-fan was far too low to make the theme work mechanically in Limited. We really need common cards of a given characteristic to bring the as-fan numbers high enough, and having common legends flies in the face of the flavor of legendary (aka one-of-a-kind things). 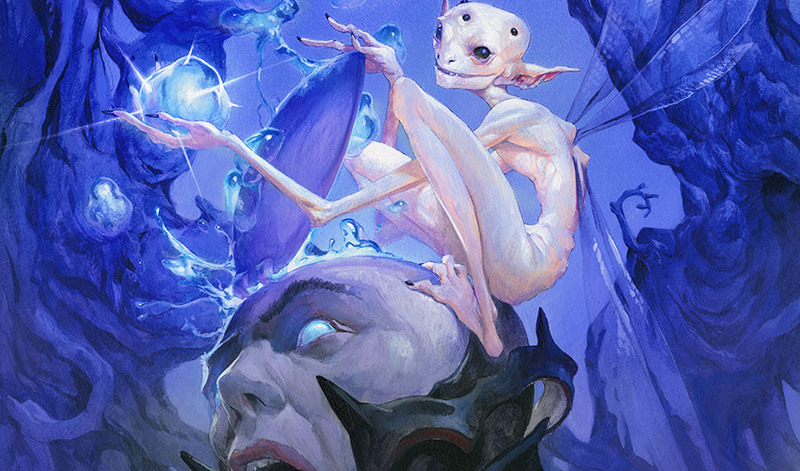 Dave Humpherys, Dominaria's lead set designer, would eventually choose to have a legendary creature in every pack (based on Ethan Fleischer's idea), which definitely helps, but even then the as-fan wasn't all the way to where we wanted to see it. The converted mana cost is how much total mana a spell costs. A spell costing 1UU would have a CMC of 3, while a spell costing 5R would have a CMC of 6. Converted mana cost doesn't care about color—just how much mana is required. Much like how legendaries skew higher in rarity, they also skew higher in CMC. More often than not, legendary creatures tend to be larger, have more abilities, and impact the game more than other creatures, which encourages us to make them more expensive. Any theme where something "matters" wants you to play a lot of it. When that something tends to be more expensive, it's harder to stuff a lot of it into a single deck. It's also really hard to fill out your curve (aka make sure you have enough differently costed cards so you can play something every turn). Legendary creatures also tend to be more than one color. For flavor, design, and Commander reasons, there are pressures to add extra colors to the mana costs of legendary creatures. This means when you stuff a lot of legendary creatures into the same deck, you tend to push it toward having more colors. To make matters worse, the cards you tend to use to help fix your colors tend not to be legendary themselves. While we make legendary artifacts, enchantments, lands, and planeswalkers (and now, thanks to Dominaria, sorceries), we tend to make the vast majority of legendary items creatures. Also, we tend to make legendary things larger and splashier. That makes a deck filled with legendary things less flexible than most decks. It tends to have to break theme to get the utility it needs. Now you might see why adding artifacts was looking attractive. We can print common and uncommon artifacts to help bring down the as-fan. We can make cheap artifacts to help you fill out your curve. Artifacts are good for both ramping and adding colors to help you play your more expensive multicolored cards. And artifacts can provide all kinds of utility. So not only were artifacts a good pairing thematically, they also helped fill in the gaps where legendary things suffer most. When I talk about mechanics, there are different kinds. Some add splash. Some add flavor. Some add utility. Some mechanics, though, are what I call glue mechanics. They make the set work. They hold everything together. From a design standpoint, a glue mechanic is a load-bearing wall. Another thing that's important to stress is that where historic ended up is not where it was when vision design handed it off. As I'm going to walk through below, there were some real problems with historic, so when I say people weren't on board with it, a big reason was that it needed to be fixed. There are stories I've told in the past where people didn't like a concept (split cards, hybrid mana, double-faced cards, etc. ), but that's not what happened here. The execution was what needed work. Historic – Whenever you cast an artifact or legendary card, DO BLAH. Problem 1 – Because it was solely a cast trigger, it mechanically rewarded you for playing cheaper spells. As I just explained, legendary cards tend to be more expensive. That meant the best way to optimize the mechanic was to play a lot of cheap artifacts. That wasn't quite the play pattern we were hoping for. Also, because legendary lands were never cast, historic didn't work with them at all. Them: I don't get it. Why are artifacts and legendary things grouped together? Me: They're both pieces of history. Them: How was I supposed to get that? Me: The mechanic is called historic. It turns out that most players skip over ability words. Keywords require you to understand what they mean because they carry mechanical weight, but ability words are followed by text that explains exactly how they work. As such, players have learned to gloss over ability words and they do a poor job of conveying flavor. Dave Humpherys understood what historic was doing in the set from a structural perspective, but had concerns about how it would get used in tournament play. He asked me if I could find a way to tweak historic to help with the first problem. Mark Globus, the set's product architect, was concerned with the second problem. People weren't getting the flavor. I needed to work on that. One of the tricky things about being head designer is that I'm juggling a lot of balls at any one time. Dominaria being in set design meant "Spaghetti" was in vision design and "Meatballs" was in exploratory design. We were also fleshing out some future worlds, so I was doing a bunch of additional work to figure out their mechanical identities. And none of this takes into account the various other projects and daily activities I was responsible for. I had to squeeze in time to give Dominaria and historic some attention. Create Effects That You Only Wanted to Have Happen Once per Turn – The idea behind this solution was creating historic cards that you wanted to activate once per turn rather than many times on the same turn. There were a couple ways to do this. You could pick an effect where a second use wouldn't add anything ("All your creatures gain flying until end of turn"). You could pick something where the single effect accomplished the task ("Tap the creature controlled by your opponent with the greatest power"). You could pick an effect that only happened once ("The next time you draw a card, instead draw two cards"). The problem I kept running into was the design space was very narrow. Create Effects That Rewarded Having Legendary Permanents on the Battlefield – This idea was to encourage legendary cards, especially creatures, by having the historic effects be more beneficial if you had them on the battlefield. For example, "double the power of target creature until end of turn" is much more efficient with legendary creatures (which are usually multiple colors, allowing a better power-to-CMC ratio) than artifact creatures (which tend to be priced higher so as to not usurp colored cards). This design space was more fruitful than the "effects you only want once" space, but still was tricky to design. Cut Back on Cheap Artifacts – We knew we could affect the biodome of Limited, and maybe, if we were careful, we could avoid the issue by cultivating Standard. But while we could affect the issue some, there were enough cards already in Standard (cough, cough, Kaladesh) that we couldn't change that our hands were somewhat tied. In the end, I had limited success, but mostly managed to lessen the issue rather than solve it. This problem was a perceptual problem, so I spent some time trying to figure out what was wrong. The ability word was one issue, but there were others. One of the interesting things I realized was that the brain treats groups of two differently than groups of three. Two items get thought of as a pairing, while three items get thought of as a collection. In other words, when you see peanuts and cashews, you just think "peanuts and cashews," but when you see peanuts, cashews, and almonds, you think "nuts." What if the key to helping players see the items as a group was to add another component? The obvious choice was to add planeswalkers. They're characters and they definitely have a sense of historical importance to them. Okay, historic was now artifacts, legendary things, and planeswalkers. It was around this time that we decided (independently of Dominaria, by the way) to consolidate the legendary rule with the planeswalker uniqueness rule by making all the planeswalkers legendary. We were back to two items. This is when I came up with the idea of listing Sagas. At the time, all Sagas were legendary enchantments, so there wasn't a mechanical reason to list them—but Dave and I had already talked about the possibility that the Sagas didn't want to be legendary for gameplay purposes. If we added Sagas to the list, Dave would be able to make the change and still have them interact with historic (being stories made them perfect flavor-wise). Dave and I talked about it and he made the change. However, while these small changes were having an incremental effect, they weren't overcoming the inherent problem with players glossing over the ability word. All of this came to a head during a meeting with Bill Rose (the vice president of R&D). About once a month, Bill checks in on how various sets are doing (the cycle means each set gets checked in on about four times a year), and it was time for him to look in on Dominaria. He recognized that there were still problems and decided that it was time to pull the plug on historic. I made an impassioned plea, saying that it was the glue of the set and that if we pulled it, the set was going to unravel. Bill said, "Okay, Mark. You have a month. At that time, I'm going to look at Dominaria again, and if you haven't solved the problems with historic, I'm pulling it from the set." I cleared as much time in my schedule as I could. If historic was pulled, I didn't know how to salvage Dominaria. That meant I had no choice but to solve the problems and save the mechanic. Oh, and Bill had added one more thing for me to solve. He was concerned that the mechanic wouldn't be resonant. While solving everything else, I had to show how historic could be flavorful. To help me, I had two people: Mark Winters and Kelly Digges, the people on the creative team in charge of Dominaria's art and story, respectively. Because I knew a lot of our issues were perceptual ones, my plan was to make a number of cards that we could mock up—complete with names, flavor text, and art—to show off to Magic players around the building to get feedback. We would then respond to the feedback and make changes. The plan was to iterate for as many cycles as we could before our month was up. I began by coming up with as many tropes as I could with the mechanic. The adventuring archeologist. The wise museum curator. The monster that returns to life whenever people read about it. The ancient tome filled with diagrams and charts of technology ahead of its time. The history buff who likes to tinker with inventions. For each one, I designed new rules text and worked with Mark and Kelly to find appropriate art and creative text. Meanwhile, I experimented with different names for the ability. I played around with expressing it as a keyword rather than an ability word. I tried new templates. I took the approach that any piece could be changed. I then showed the cards around to as many people as I could and collected their feedback. Often, I would have multiple versions for input. I asked about first impressions, I quizzed them about what the cards represented, I sought out suggestions for change. I then collected the data, shared it with Mark and Kelly, and started the next iteration. Eventually, I came to realize that I wanted the vocabulary word in the rules text. I wanted players to have to read the word "historic" before they knew what it was, because when I asked players in a vacuum what a "historic card" was, their intuition was basically on track. My idea was just to use the term in the rules text and then explain what it meant with reminder text. This way, the players had to process the word. They couldn't skip over it. "When you draw a historic card . . ." What does that mean? What is a historic card? Then they would read the reminder text. "Oh, that's what a historic card is." It forced them to think about the concept as a new thing and then gave an answer to reinforce it. The problem was, it wasn't a traditional keyword and it wasn't a keyword action. It was something new. I didn't have time to worry about figuring out what it was. I just pushed ahead and tried it out. And it worked. Players could no longer gloss over the word, so they had to think about it, and then when we explained it in reminder text, the most common response was "that makes sense." I later ended up calling the new technology "batching." It took various game components and then connected them into a larger group with a new word. Even more exciting, I realized batching would help us with our mechanical issue. Since it was a new piece of Magic vocabulary, historic became a component that could be stuck wherever we wanted. You didn't just have to care about casting a historic card—you could look for one, or return one from your graveyard, or do just about any effect you wanted. The vocabulary disconnected us from having to do all the effects the same. I did another round of reviews with the newest version, and the mechanic got the best feedback it had gotten yet. Players were not only getting the concept, they were loving the mechanic. I took the data back to Humpherys and Globus, both of whom were happy with the direction the mechanic had gone. Okay, I made the lead set designer happy, I made the product architect happy, I had a collection of strong feedback—it was time to sit down with Bill. I sat down with Bill and showed him the latest versions of the cards. I shared all the feedback I'd collected. I walked him through how the changes answered all the problems the mechanic had. I explained the various resonant trope space Mark, Kelly, and I had uncovered. Bill thanked me for the presentation and said he needed a day to think about it. Two days later I heard from Bill. He wanted to replace the mechanic. I was given the task of replacing historic. I didn't know where to start. Over the months, I had spent a lot of time thinking about this problem because there had always been a worry that I might be asked to remove it. The reason I had doubled down so hard on historic was that I hadn't come up with a different solution. I looked at focusing on legendary as a theme, but it had all the problems I listed above. I think at this point Dave had committed to one legendary creature per booster pack, but it wasn't quite enough for Limited. 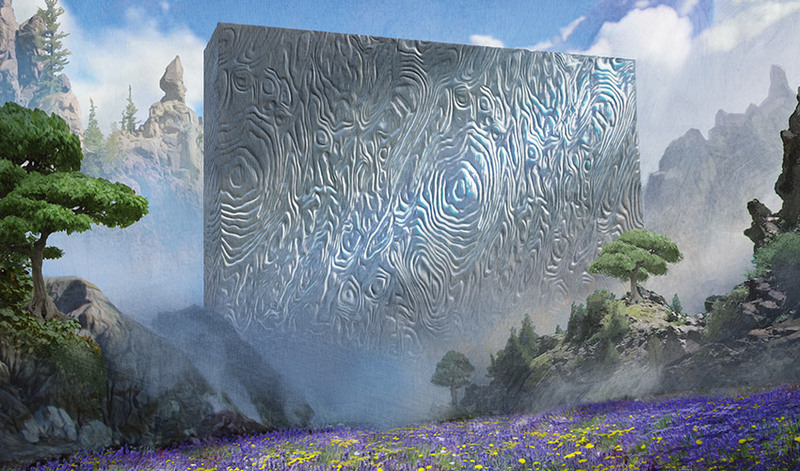 Artifacts not only provided common cards to up the as-fan, their colorless nature was upping what R&D calls their "as-played," or how often they showed up in Limited decks. Being able to go in any deck allowed them to show up in more decks than most cards. No simple solution worked, so I started getting more creative. I looked for out-of-the-box answers. I questioned every assumption that I had come to believe was true. Where was the path to make it all work? I couldn't find one. I really, really tried and I couldn't do it. The set had been built around historic. Taking it out left an odd-sized hole. So I dug down deep and looked for any solution that could possibly work, and I realized I only had one viable option: How could I change Bill's mind? As it turned out, the answer was twofold. First, Magic R&D is very team oriented. Bill relies a lot on the expertise of those around him. I set out to convince every member of R&D that historic was the best solution to our problem. I wrote up a letter explaining each issue in detail and talking about how historic solved it and what problems would arise from historic not being in the set. I walked through various solutions for individual problems and explained how certain solutions to one problem cut off solutions to other problems, some even making brand-new problems. I demonstrated how each component connected and showed the work historic was doing. I used the letter and associated talking points to convince everyone (save Bill) that historic was the best solution to our problem. Second, once Bill could see that there was uniform support for historic among R&D, Dave and I sat with him and walked through all his issues. We figured out how we could address each one with the execution of the mechanic. Some of the solutions involved coming up with some rules for things we wouldn't do with historic. For example, we made sure that all the artifacts in the set truly conveyed a sense of history. A normal Magic set might have a shovel, but in Dominaria the artifacts would represent items from the past. Some issues were addressed by the different types of historic cards we made. 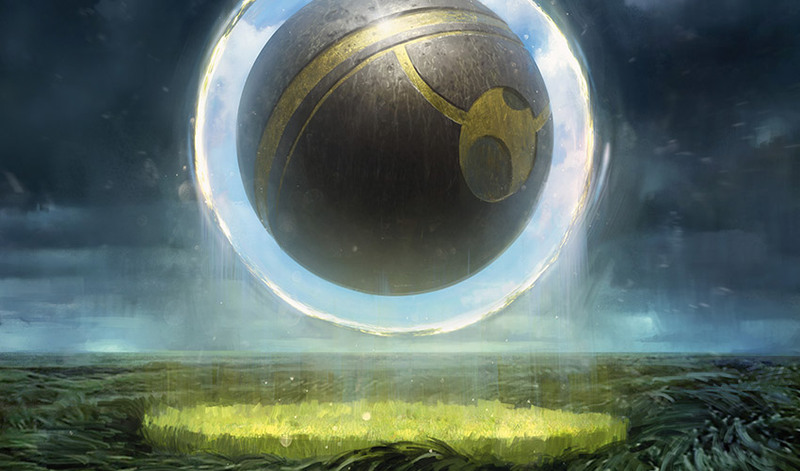 Other issues were addressed by which historic cards we pushed for Constructed. In the end, we got Bill on board by showing him that his concerns could be addressed on a card-by-card basis. And finally—finally—Bill signed off on historic. The point of this story is that getting to the right place is a collaborative effort. While it was a difficult road, it led to the best execution of historic. I am very proud of the batching technology and lots of the individual card designs that came out of this process. Historic ended up being not just the glue of the set, but also a mechanic that gets to shine in its own right. This isn't a story of "they should have listened to me," but rather "I should have listened to them earlier." This is a story of how our processes allow us to make the best possible end product for all of you. If you want to understand the ups and downs of working on Magic, the story of historic is an important one, and I'm glad I got to share it with all of you today. Before I go, though, I have a cool preview card to show you—one of a legendary creature that is, in fact, quite historic. This is a character I made with Michael Ryan when we originally created the Weatherlight Saga. It's the teacher for Gerrard, Mirri, and Rofellos, the one who taught them magic. It's also an Elemental guardian. Yes, it's time to meet Dominaria's version of Multani, Maro-Sorcerer. 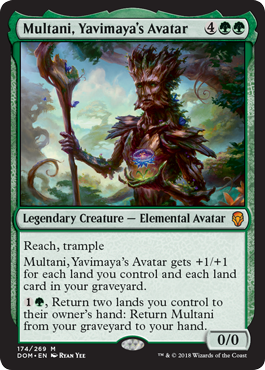 Click below to meet Multani, Yavimaya's Avatar. I hope you enjoyed today's article. I don't always go in depth on a single mechanic as much as I did in this one, so I hope you all enjoyed it. As always, I'm eager to hear your feedback not just on today's article but also on the historic mechanic. You can email me or contact me through any of my social media accounts (Twitter, Tumblr, Google+, and Instagram). Join me next week when I start sharing some Dominaria card-by-card design stories. Until then, may your task be slightly easier than getting historic to print.